Here it is only Big Sister E's second year of preschool and I'm already overwhelmed with the amount of papers, projects and artwork that she brings home with her each day. I have to admit that I started off doing well last September, dutifully keeping and filing each cute new addition... because each and every one is a memory, right? However, by October and November, things were already starting to go downhill. Instead of being put away, papers were left in piles and where once the art was hung up and displayed, it was now just ending up a mess of glitter, glue, and cotton balls. I really didn't want to just put everything in a big bin because that was just going to result in a future overhaul that would never get done. So that left... well, unfortunately that left the garbage and recycle containers. Big Sister E would come home, show off her latest creation for me to ooh and ahh over and then? Tossed. Does the guilt lessen as the years go on? I hope so. Thinking that my daughters were going to end up with nothing to show for their childhood, that's when Creative Toyshop appeared in our lives and with it, the School Year Album. 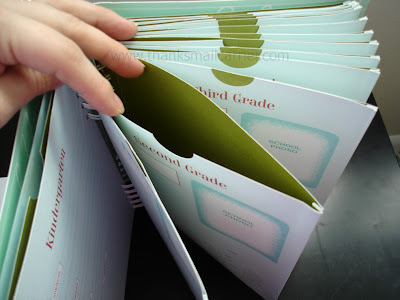 Durably constructed out of thick card stock, the School Year Album is exactly what parents like me are looking for when it comes to organizing and storing the mementos from each year of their child's schooling. 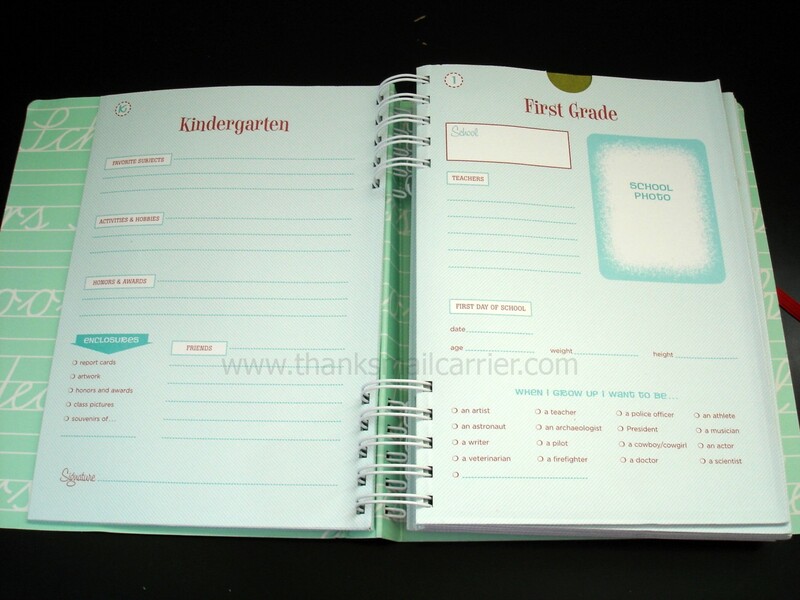 Simply jot down the highlights and important info from kindergarten through twelfth grade, attach a photograph, and slide items such as schoolwork, report cards, and more right into the convenient pockets. Much more attractive than a plain folder, as soon as I saw the School Year Album I knew it would be something that I would have no problem displaying in my home for years to come. Inside, I really liked the simple, clean layout of each page and just how easy it is to fill each one out throughout the year. From including facts on height and weight (how fun to compare later!) to filling in big events and happenings, I couldn't think of anything more that needed to be included... yet I also didn't look at the pages thinking that I would never take the time to write on the lines (i.e. the blank baby books that I have for both of my daughters). As well as the written memories from each school year, the addition of the expandable pockets on each page are just the right amount of space for tucking in artwork, favorite projects, reports, letters, and more. Not only will I be able to look back and know at what age Big Sister E was when she made a special drawing, but it will be easily accessible and safely stored. 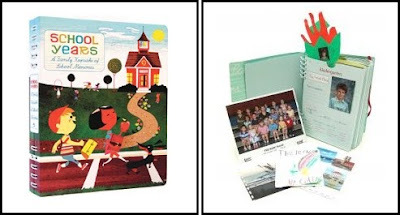 Retailing for $19.99, the School Year Album from Creative Toyshop is the perfect way to keep mementos, photos and memories organized in an attractive and compact (measuring 7⅝" x 9½") way. I'm looking forward to seeing how it changes over the years from an empty canvas to a book filled with childhood memories! 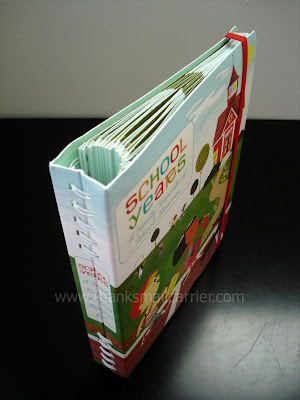 The School Year Album is just one of the unique educational toys, games, and other items found at Creative Toyshop. This boutique online store also offers a great line of innovative and eco-friendly products that encourage children to think for themselves and express their creativity while not harming the environment. From the Calafant cardboard toys to the Young Learners games to the pedal-less Boot Scoot bike, in the past three years Creative Toyshop has grown into a popular online destination for families that are looking for special gifts for the children in their lives. Shopping is fast and easy and there is even free shipping (to the contiguous 48 states) on orders over $50. One lucky person will win a $10 gift certificate to Creative Toyshop! To enter to win: Visit Creative Toyshop and tell me what you might purchase with this gift certificate if you win. 1 Extra Entry (per method) if you Like Creative Toyshop on Facebook and/or follow them on Twitter. Giveaway will end on May 11th at 11:59pm CST. Do me the favor of leaving an email address or making absolutely sure it is visible in your profile, I have to have a way to contact the winner. The winner will be chosen by random.org and announced here as well as emailed and will have 48 hours to contact me or respond to notification or a new winner will be chosen. This giveaway is open to U.S. residents only. 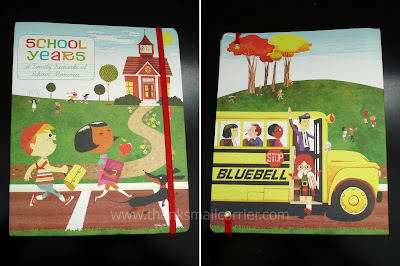 A big thank you to Creative Toyshop for providing a School Year Album for me to review as well as a $10 gift certificate for one lucky giveaway winner. The opinions shared are my own and honest and if you really need to see more, click here to see how I roll. One of my little ones is obsessed with camping trailers and RV's, so I would def. have to choose the Camper Van for him to color and create! I'd love to get the School Year Album. I might put it toward the calacastle. I would definitely put it towards the school album because like you I have a pretty big pile of papers and drawings from her kindergarten year already.. And that's just the stuff I kept. FYI I use packing envelopes for a lot of my daughter's papers. They don't take up near as much space. I would get the school year album. like thanks Mail Carrier on faceboo Lisa W.
I'd like the snack size Lunchskins. I would love to have the counting sheep game. I would get one of the cool lunch skins. I would love to get Recycle It! game for my classroom. I entered your YourBagTag Giveaway. I entered your Local Pages Giveaway. I entered your Melissa & Doug Trunki Giveaway. I entered your Guidecraft Hideaway Country Kitchen Giveaway. I'd get the Camper Van!